When it comes to Nintendo’s first-party output on the Nintendo Switch, their reliance on dipping back into their Wii U catalogue has been met with an assortment of reactions from gamers. Some see it as a second chance for these often-critically well-received titles to find a larger audience – the Wii U not exactly boasting the strongest install-base even by the end of its life. For others (and largely those who already played them on Nintendo’s last system) these ‘enhanced versions’ are a far less exciting event, a revisit too soon to be truly appreciated by the player. Whatever view you have though, the steady stream continues and next up is the unexpected gem, Captain Toad: Treasure Tracker. Part-actioner, part-platformer, part-puzzler, Captain Toad: Treasure Tracker sees you taking on the role of the adventurous Captain Toad (and later Toadette) as you pilot your way through a series of small bite-sized cuboid environments avoiding danger and collecting gold stars. Captain Toad isn’t quite as capable as the limber Italian plumber, his movement much more sluggish and methodical and any form of jumping eliminated. In fact, your only real means of defending yourself so to speak is plucking up vegetables to lob at enemies. It’s this restricted move set though that gives Captain: Toad Treasure Tracker its light-puzzle focus. 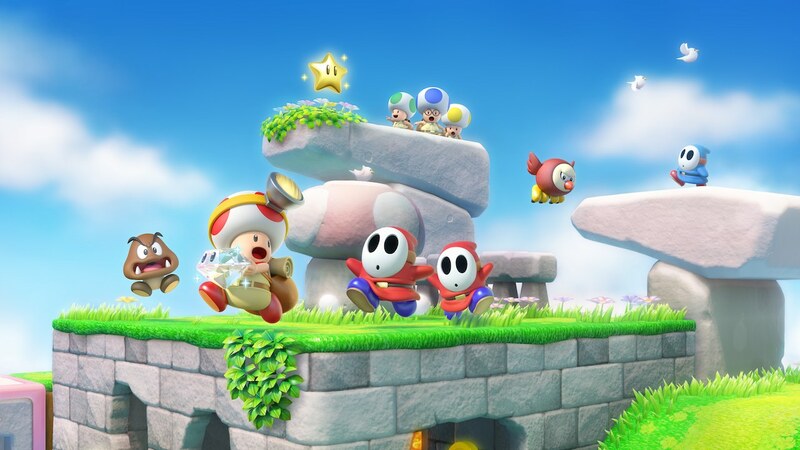 Whereas Mario can overcome a situation more often than not by attacking, leaping away or using an assortment of power-ups, Captain Toad must rely on his short legs and the player’s ability to plan ahead. While we’re never talking Professor Layton levels of complexity here, it’s certainly a refreshing take on the Mario universe. Each stage you tackle is essentially its own miniature playground – a mishmash of sparkly items to collect, enemies to side step, platforms to interact with or even a giant boss battle to outwit. Your main goal is always to locate and gather a single gold star, often tucked away or in plain sight but just a little out of reach. The camera is your main tool to accomplish this, the game offering you complete 360-degree control as well as the ability to zoom in for a better look at your surroundings. An initial glimpse of the world, for example, might yield little solution in where to head next, but by simply rotating the camera or zooming in you’ll constantly find nooks, useful items or passages that are hidden away. For those after a little more challenge three gems are also scattered around each stage, most requiring you to stray a little off your main objective path. While never truly taxing to find, they do offer an incentive to explore a little more. Likewise, unique missions assigned to each stage add a further reason to return, sometimes testing your ability to gather coins, defeat enemies or find golden mushrooms. You’ll find yourself traversing a range of environments throughout your adventure, each stage usually focused on a single idea or gimmick whether it’s moving large sections of the stage by tapping the screen, riding in a mine cart and lobbing vegetables to grab coins or controlling a squad of Toads using the Double Cherry power-up. While the number of ideas on display is certainly plentiful and fun enough, it feels like their implementation in the level design never reaches the ingenuity of, say, a 3D Mario platformer. Stages are short and usually pretty simple to complete rarely offering enough time or space for an idea to truly bloom. And maybe part of the reason for that is Captain Toad: Treasure Tracker never commits to one particular genre. I wouldn’t label it as a pure platformer nor would I say it truly gives your brain a workout in the same manner as a proper puzzler. Instead, it finds itself wedged somewhere between the two, attempting to cater to both genres and therefore never realising either of their true potential. In its place, we have a game that opts to craft its own laidback experience that’s going for something very different – a fun small-scale adventure that’s relaxed, simple and hearty fun. Controlling the game feels right at home on the Switch with the Handheld mode at an advantage over docked thanks to the system’s touch screen. While using the Joy-Con or Pro Controller as a pointer when playing the game in TV mode works fine, it’s no replacement for the ease and accuracy of simply tapping on a screen. Also when playing docked the pointer cursor remains on-screen even if you’re focusing on using traditional button controls. It’s odd this simply can’t be switched off. Just like Donkey Kong Country: Tropical Freeze before it, the amount of fresh content in the Switch version of Captain Toad: Treasure Tracker is limited. The two-player co-operative may be exclusive to this updated release but unfortunately, the second player’s role is limited to using a Joy-Con to point at the screen and run interference on enemies or throw vegetables. It’s a neat means to include a younger player in the fun, sure, but for those after something a little more substantial and involved this doesn’t deliver. The other big new addition is the Super Mario Odyssey-inspired levels. While great fun to play, they’re unfortunately over far too quickly as just four stages in total (Metro, Sand, Cascade and Luncheon Kingdom). This almost feels like a tease of what could have been a real selling point for those who already played the Wii U version. Super Mario Odyssey had plenty of kingdoms to base levels on and it’s a real shame we only get a small handful. It also seems odd that the handful of levels based on Super Mario 3D World have been removed entirely, a small disappointment but a strange absence nonetheless. Locating a pixelated Toad on each stage is now included as opposed to unlockable via scanning an amiibo and beyond that, there’s not much else added to this package. Overall it’s an underwhelming effort and one that makes this a tougher sell for those who’ve already experience Captain Toad’s adventure before. Visually, it is an absolute delight. Every character, whether it’s the heroes themselves or the enemies in their path, radiate charm while the miniaturised worlds take you everywhere from lush beaches and sandy temples to dusty canyons and haunted mansions. There’s cheeriness to the visuals that feel right at home in a game focused on the wide-eyed character of Captain Toad. The music too, while nothing truly outstanding fits the overall vibe even if it is pinching some tracks from the previously released Super Mario 3D World. It turns out that Captain Toad: Treasure Tracker is still a fun time albeit one that could do with a healthier dose of fresh content in this Switch version. Walking the line between platformer and puzzler, the game’s light sprinkling of elements from both help create an experience that’s fun for all ages. Relatively easy going and perhaps never as ambitious as it could be, Captain Toad: Treasure Tracker is a cute little addition to the Mario universe and proof that it’s not just the famed plumber who can have grand adventures.